You do not have to search far to find a fantasy baseball analyst warning against trusting the noise generated during Spring Training. "He's in the best shape of his life" and "I'm definitely going to steal 40 bases this season" are the phrases that make us drool but are probably best ignored. It is about ignoring the subjective and concentrating on the facts. Nothing wrong with that. But once in a while the objective case needs the subjective ideas to form a complete picture. According an arrest affidavit, a deputy spotted a car [Miguel] Cabrera was driving, smoking on the side of Okeechobee Road in Ft. Pierce, about 100 miles southeast of the Tigers' spring-training base in Lakeland. 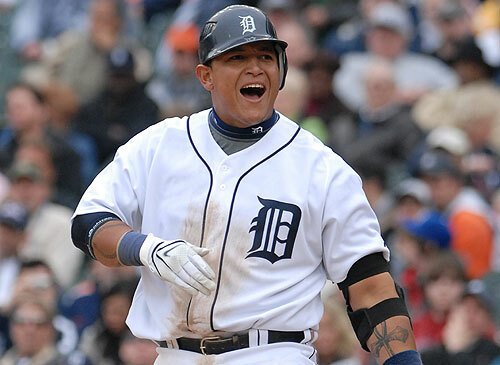 Cabrera had an odor of alcohol on his breath, his eyes were bloodshot and watery, and his speech was heavily slurred, according to the report. In the arrest affidavit, deputies said Cabrera repeated, “Do you know who I am? You don’t know anything about my problems.” Cabrera then picked up a bottle of James Buchanan’s Scotch whiskey and started drinking, according to the report. Miguel Cabrera has an alcohol problem. He is not willing to admit that at this point. The Tigers believed that they had nipped this problem in the bud after the 2009 incident. A stern talking to and a few apologies were never going to be enough to truly solve this problem. How do I know he has a problem with alcohol? If you get in trouble with the police because of your drinking, even if it is only once in every 365 nights you go drinking, you have a problem. But if you're paying attention you'll note that this is me applying my thoughts to to the facts about Cabrera. We are not supposed to do this. If the Detroit Tigers think that a week of "rehab" is enough to address Cabrera's problems, they aren't taking his alcoholism seriously. The Tigers are now saying that he may make his Spring debut on Monday. 'Nuff said. Now does that mean that Miguel Cabrera shouldn't be your first round pick? Tough to say. I have been criticized in the past for suggesting that I wouldn't draft Cabrera because of his untreated alcohol problems. In addition, I don't think he takes his position as the leader of the Tigers offense seriously. I don't believe he gives much consideration to conditioning. None of that makes him a bad person or even a bad player but in my opinion he is a serious risk to dash a fantasy team's championship hopes. It's 50/50, in the first round I want better odds. At his long-awaited physical exam and official weigh-in Friday, [Pablo] Sandoval tipped the scales at 240 pounds, according to Ethan Banning of Triple Threat Performance, which coordinated his offseason conditioning regimen. 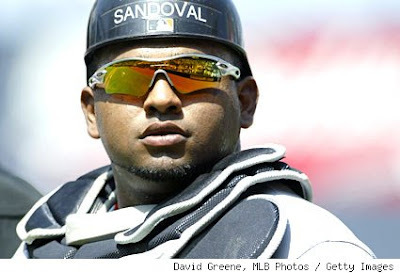 Sandoval weighed 278 pounds at the end of last season. He also reduced his body fat measurement from 30 percent to 19 percent, Banning said. "That's not Mr. Universe, but it's a long way from where he was," Banning said. Banning estimated that the 5-foot-11 Sandoval gained nearly seven pounds of muscle on the highly disciplined nutrition and training plan, so his total fat loss was closer to 45 pounds. It is tough not to love Pablo Sandoval. Not only does he obviously love playing baseball, he looks like a lot of us. So when we hear that Kung-Fu Panda is in the best shape of his life, we cheer for him and then we ignore it. It won't improve his plate discipline after all. His agility and ability to play defense is likely to improve, at least to the level it was in 2009. In case you missed it, Sandoval was benched last year because of his defense, not his bat. So, he'll get more at-bats. His endurance should improve. He should be stronger later in games and should require fewer late-inning substitutions. So, he'll get more at-bats. His confidence is soaring. As we know, half of baseball is 90 percent mental. What is the most important thing a player needs to have for offensive success? That's right, tons of at-bats. Sandoval is an excellent contact hitter who has good power (maybe even better now after training with Barry Bonds' boys) who looks like he'll get a ton of bats. Not only do I think Sandoval being in the best shape of his life is significant, I think it is the primary reason we can expect a big bounce-back season. Bautista is an above average offensive player most years, but not by much. He appears to be a negative on defense, although his flexibility is a nice asset, and this is his 30-year-old season –leaving little doubt he will decline over the length of the deal. A replication of 2010 is highly unlikely, so being an above average player for the duration is the perfect world outcome. More likely? He earns some surplus on the front side and the Jays are ready to get rid of the deal by 2015. When Jose Bautista signed his big new contract this week it was trashed by many of the smartest writers around. They look at the stats and see that Bautista's 2010 season sticks out like a sore thumb. It must be a fluke! How can a player go from slightly above average to suddenly great? You won't always find the answer in the stats. Instead you need to look closer. Jose Bautista may have struggled to find a full-time role while with the Pittsburgh Pirates but think about that. The Pirates? They haven't won meaningful games in a decade and haven't done it two straight seasons in two decades. They are routinely trashed for making lousy personnel decisions. Until very recently they've struggled to develop major league talent despite having top picks in every draft of the last 20 years and certainly lacked the ability to coach them up. Even with the Pirates a closer look would have revealed a slightly flawed player with good power. The Blue Jays saw a decent player they could turn into a better one (the Red Sox did too, just sayin'). You can check out this detailed explanation by Frankie Piliere for the specifics. But the mechanical changes are very real and they matter. If he can maintain them there is no reason he can't remain at a new level of effectiveness. This isn't noise, these are facts. I like that the Blue Jays signed Jose Bautista. Yes, it is a bit of a gamble but guys that can smack 50 homers a season are especially rare in the post-steroid era. If he has a strong follow-up season he would have gotten at least that and more. He can hit, hit for power and field two positions very well. This is not the next Vernon Wells contract.